Dry sump with separate oil tank. Multiple disc wet clutch with patented PPC power-assisted hydraulic control. Box section sloping twin-spar aluminium alloy frame. 43 mm diameter upside-down fork; 120 mm wheel travel. adjustment system for rebound, compression and preload. 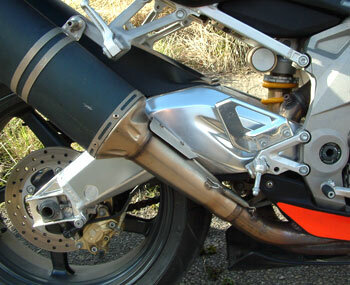 Double banana aluminium alloy swing arm and APS progressive system linkage. Hydraulic shock absorber with piggy-back cylinder and adjustable rebound, compression and preload. 133 mm wheel travel. Front: Brembo double Ø 320 mm floating stainless steel disc. Radial calliper with four 34 mm diameter pistons. Braided metal brake line. Rear: Brembo 220 mm diameter stainless steel disc. Two-piston (32 mm diameter) calliper and Braided metal brake line. 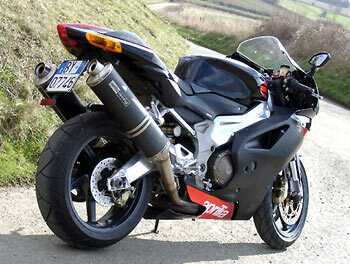 Aprilia RSV Mille 'R' - do it the italian way! Road testing any superbike on the salty, slippery and usually damp mid-winter British roads is always a somewhat challenging experience, and to say I had reasonable weather whilst with the Aprilia is probably and understatement! I think I had 1 day where the roads were actually clear of salt, that's only because it rained heavily on the previous day and as usual I got caught in it! Last years R had the exotica already fitted to make it an R, Ohlins suspension, OZ race wheels etc, etc, but this years '04' R has the standard Showa front and a Sachs unit at the rear; you have to go to the next step, the Mille 'Factory' to get the same treatment as the previous R. That model comes with all the Ohlins goodies including a top spec steering damper which the new R doesn't get at all, and of course Brembo radial brakes. We'll be testing a Factory in a couple of weeks, so keep coming back. Well that just about explains it, if you got lost somewhere just keep reading! The instant giveaway that the new Mille R is not just a re-vamped '03' model is the bodywork. We now have a very angular and much slimmer profile than the bulging rounded lines of the '03' model, this gives the new bike a very sleek look indeed, and give Aprilia credit here, it's a stunning bike to look at now. As per quite a few bikes today including Ducati's 999/749 range, the front indicators are built into the mirrors. It creates a very slim profile now, but again a-la-Ducati you really can't see much in them without having to lift your arm to stare back under your armpit. What's behind doesn't matter, it's the prey in front of you that counts!! The smaller, more compact appearance of the new bike made me think at first that the rider space had become more compact too, though I was proved to be completely wrong on this. Although the new bike has a lower windscreen, there's quite a bit more room between the seat and the fuel tank. This means that you can tuck in a lot more than the previous model, and another bonus here is that the overall aerodynamics will be improved at speed. Both the old Mille and the '04' R do still have a similar feel to them, but the '04 makes you feel if you are sitting 'in' the bike, rather than 'perched' on top of it. It just doesn't feel a high as the old model, a criticism many potential buyers had when looking for a rather exotic v-twin. The new Mille sits a full 2.5cm lower, and if you had ever had any doubts about touching the ground on the old one then I would suggest a look at the new Mille R. I don't think you would hesitate now. Sitting on the new bike you are immediately faced with a full set of brand new instruments. Gone are the ex - Fiat Strada surplus units! Now they have been replaced with a very neat single piece unit with a digital speedo and analogue tacho. All the lights are in the right place and when you turn on the ignition the bike does the usual modern pre-flight check. There is also a full timer facility, clock, mph/kmh conversion mode and even a side stand warning light! The layout on the rest of the bars etc is still pretty much the same with the exception of radial master cylinders. The switch gear is still the usual 'funky' Aprilia layout with upside down horn and indicator switches providing endless fun to other road users as you sound your horn to turn right at a roundabout, or flash the lights to warn someone, it will take you a few days to get used to this, it did for me anyway! As regards the rest of the front end of the new Mille R, when looking forward from the new riding position the frontal area is now much smaller and lower. You can spend a lot more time concentrating on the road ahead as the bike almost disappears from your view. The adjustable alloy levers are also very good, fine tuning to your exact needs, they are light to operate and easy to use, even with new waterproof gloves purchased when my others (leather race gloves) were just soaked through! The Mille R feels extremely narrow all over now, gone is that slightly outdated styling, what you have now is a slim, modern styled superbike with integrated indicators both front and rear. 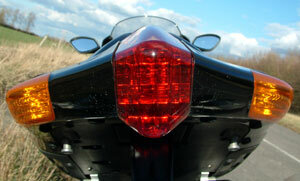 The rear indicators are in fact housed in possibly the sleekest, sexiest looking tail unit on any current motorcycle. Here is a bike to rival the best exotica from Italy. 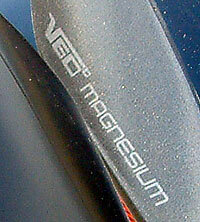 Hidden away under the sweeping alloy frame rails lies a brand new engine called the V-60 Magnesium. It is essentially the same layout of a 60deg V-Twin and has 4 valve heads with double cams, but that's about where the similarity ends. Aprilia have designed new heads for better combustion, only a single plug is now needed per cylinder, it has new cams and valve springs and a whole host of extra little things to make up this engines claimed 139 bhp. In the electronics and fuel department we now have 57mm throttle bodies instead of the previous 51mm, new intake ducts, a single injector per cylinder, and a new pressurised air-box giving some 3% increase in power on the move. All this is managed by a new ECU with 15 sensors on the bike to fine-tune it through an diagnosis terminal in the instrument cluster. All these modifications to the '04' R have made a huge difference in the overall ride on the road. Now we have a very responsive engine with lots of smooth power delivery right up the range, but there's a surprise still to come when you get beyond 8,000rpm.. Lots more power suddenly appears up to the rev limiter around the 11,500rpm mark. The new bike becomes a Wolf, ready to give chase to anything in it's path, it's great fun!! Riding it on the road in winter is probably not the best place for it in reality, all that alloy and those designer Italian fittings do take a bit of a 'hammering' on the UK roads, but a quick jet wash soon gets rid of all that salt bringing the gorgeous looking Aprilia back to it's former glory. In general on road riding all you need to do is to ride it around at about 5-6,000rpm, run a gear higher than you think, and it will pull smoothly and feels totally relaxed to ride. A Sunday cruise is about the best description for it, but take note here, in 6th gear you will find yourself doing about 90-100mph, and feeling as easy as you would at 50mph! Once you Start to get used to the power delivery it's time to play! On the one dry and salt-free day I had it gave me a good chance to try out the bike on something other than slippery or wet roads. 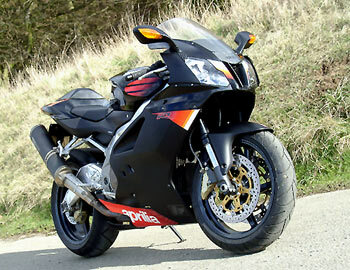 The Aprilia is a fast bike, a seriously fast bike, but there are faster ones out there. Any 1 lt Japanese 4 cyl superbike will give the Mille a real run on speed and acceleration, but when it come to feel and stability the V-Twin has it. Four cylinder bikes are brutal in their power delivery, there's no room for the slightest error or it will spit you off, but the Millle is a lot more forgiving. The balance of power delivery, good handling and good brakes makes this bike so much easier to ride fast on ordinary roads than your average four cyl superbike. 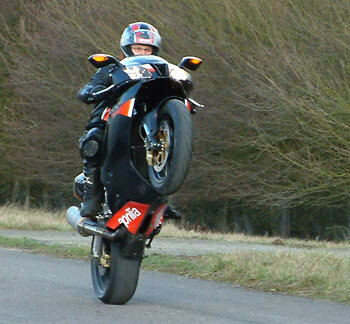 Sure it wheelies on power in 1st to 3rd, and it will spin up the rear wheel if your'e heavy handed, but with it's balanced Showa front USD forks and Sachs rear unit it always feels solid and firmly fixed to the road. The one thing I would advise is the steering damper upgrade as it tends to shake it's head under heavy acceleraton, and when you discover that the front wheel has been airborne for the last 100mtrs! The Aprilia Factory and the standard Mille 'R' share the same base chassis geometry as the old model, but subtle changes are obvious throughout including the headstock which has been repositioned lowering the new bike. More lowering has also taken place with the swing arm mountings, and the pivot and is now further forward by 0.5mm. The engine sits 4mm further over to the right completing the changes, so the outcome of all these changes adds up to a very different bike indeed. The standard mount, Brembo four-pot calipers on the R model are very strong and provide lots of feel, and they're all you'd probably ever want - as long as you don't try the the feel and power of the radial mount Brembo calipers of the Factory model, then you may change your mind to overkill! On the road one of the most noticeable changes is the way the bike turns in on fast corners. The old Mille always used to feel as though it wanted to run in wide asking for a little muscle, on the new '04' this is just not the case. Unfortunately as the roads were mostly slippery it did show a tendency to want to run wide on the exit of corners, but I mainly put that down to the slippery surface and to the standard Michelin Pilot Sports, not a favourite feed-back tyre of mine at all! The 43mm Showa forks allow adjustment for spring pre-load, compression and rebound damping, I did find the standard settings a bit too hard for general road use, but on smooth roads they worked well, so track use should be great! I found the rear Sachs unit to be behaving very well in any conditions, no need to alter anything there. The Mille also has Aprilia's pneumatically controlled clutch on it and this contributes to super smooth corner entries allowing slip on deceleration stopping the rear wheel hopping after a quick downchange. Dry weight quoted for the Aprilia Mille R is 185kg, so it's not a lightweight in comparison to most Japanese superbikes with about a 20kg handicap. This doesn't really come into it in the real world, only on the race track would it be at all noticable, but then the twin does have it's advantages in so many places over the mad 4cyl 1000's! In conclusion the Aprilia RSV Mille 'R' is fast, it's exotic, it's seriously stylish, and both gets and deserves the looks it receives from other bikers and road users. Aprilia have made sweeping changes to the Mille, it's changed from a somewhat overweight looking and dated bike into true Italian Stallion. The Mille R and the Factory are bikes for the enthusiast Italian sport-bike rider, they are absolutely beautiful to look at, and even more beautiful to ride. At the end of every ride, even in some of the worst weather, I walked away impressed. The new Mille is faster, more composed, and probably the most important point here, is easier to use than ever. Comfort is not n issue here, you don't get sore on it in general riding. The only time I ever felt any pain was after a serious amount of traffic and filtering, then the wrists suffered a bit, but that's it. The new bike has been improved in almost every department regarding performance and handling, its looks are up to each individual, but I can honestly say it looks fantastic. If I were the owner of an older Mille and tested one of these then I'd be handing over a cheque for one tomorrow. Still that's just my point of view, everyone has their own tastes, to each their own I say! I'll be continuing the Aprilia testing with a Factory in about 3 weeks...keep an eye out for it!